Built Tough for Large Air Consumption. 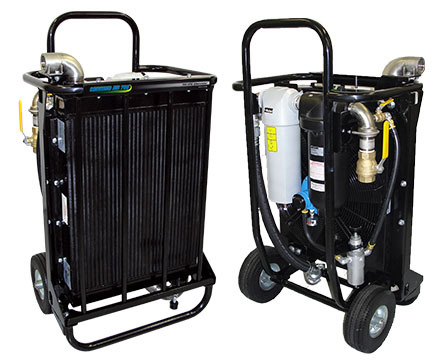 The Command Air CA-700 after cooler dryer is built on a universal frame with a hand truck design with airless tires for maximum portability. A rugged encased frame allows for better protection of internal components during transport and shipping. The oil free motor requires less maintenance and the Command Air CA-700 also comes equipped with an upgraded regulator, automatic drains and coalescing filters. When using the Command Air CA-700 after cooler dryer the air from hot, oily air produced by diesel air compressors is cooled and dried to 0.7 microns. The cooled, dry air allows your blasting equipment to work at the highest efficiency possibly while minimizing downtime and freeze-ups. The Command Air CA-700 after cooler dryer is perfect for jobs that require large air consumption. For example, you can run two dry ice blasting machines at regular pressures and volumes or one large dry ice blasting machine at maximum pressure and volumes. In addition, the Command Air CA-700 after cooler dryer is a universal piece of equipment suited for other types of media blasting equipment including dry ice, sand or soda blasters.